According to weather.com, it is currently 9 degrees outside but feels like -3. I know I’ve talked about the weather enough, but it hasn’t been this cold around here in a long time. This sort of painful cold reminds me of my college days in central New York. My alma mater is in the Finger Lakes region, right on the shores of Seneca Lake. Seneca is narrow but so deep it rarely freezes over. Here in the Pioneer Valley we are a bit sheltered thanks to the protection of a few mountain ranges. As a result it’s always a few degrees warmer here than it is in the surrounding areas. But central New York is flat. Winds whip through, lake effect snow travels far, and the winters are really really cold. I miss the beauty of the lake and vineyards, but not much else about the geography out there. That’s one thing I can say about these temperatures: at least (knock on wood) there’s no biting wind. 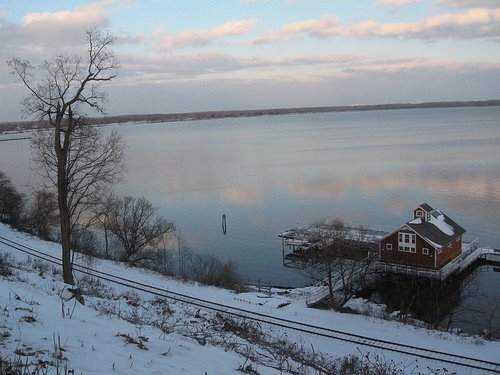 The highly-regarded and very dedicated HWS sailing team practiced on the lake in the snow. It was a surreal thing to see. My sailor roommates came home from February practices with blue lips and stood in the hot shower for hours trying to thaw. I wore long underwear under my jeans for the walk across campus to class, the hood of my ski jacket pulled tight around my face, only my eyes showing above my scarf. There was rarely a day between November and March that it didn’t snow, and snow in April was common. It was during those arctic winters that I learned how to make various mixed drinks using hot beverages. I guess this cold snap is making me a bit nostalgic. I’ll need to post about something other than the weather, but I live in New England, talk about the weather is what we do. 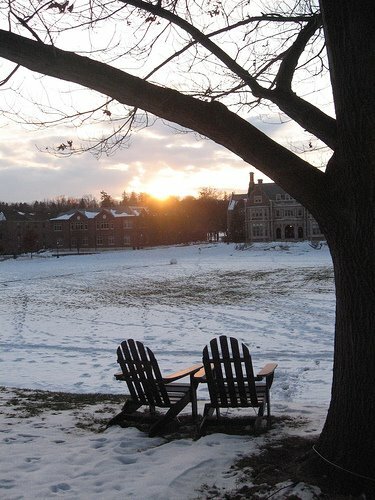 photos: The Hobart and William Smith campus, taken during my most recent visit in December 2007.